Information about how to report graffiti to the City of Albuquerque. If you witness graffiti or vandalism please call the Albuquerque Police Reporting Unit at (505) 768-2030. Removing graffiti and repairing the damage it causes is costly. Business owners, community organizations, and individual households are not immune to the threat and effects of graffiti. 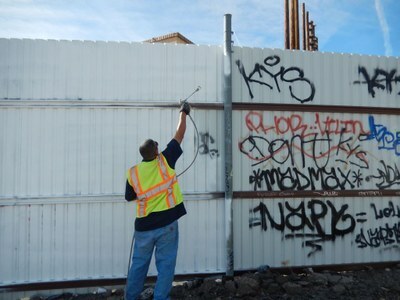 You can help reduce graffiti by immediately reporting all graffiti sightings to ABQ311. Graffiti removal paint crews work throughout the week to eliminate graffiti on public and private property free of charge. Report graffiti via the form below or call 311.